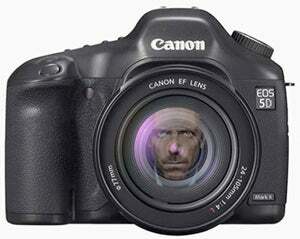 If the Canon EOS 5D Mark II was good enough to film the entire season finale of House on, there it should be more than adequate to use as a Skype webcam. But how? Fortunately, Canon fanblog Planet5D has put together a video how-to explaining just how you use it for Skype, or as a livestreaming camera for Ustream. They recommend using it with Macs, as they prefer the CamTwist software—but apparently there is a Windows equivalent. You'll also need the Canon EOS Utility program (from the software CD bundled with your camera) and a download of Skype naturally. Using a Canon HDSLR (5D Mark II) as a webcam for skype or ustream from planetMitch on Vimeo.